April 21st, 2013 (8:49 AM). Where do i find the four legendary pokemon? April 22nd, 2013 (2:11 PM). Edited April 23rd, 2013 by giradialkia. i am getting a little frustrated with the waiting game. :( hope your still working on this hack, but than again you might have school work and life in general that keeps you busy like everyone in life. hope i didn't come as a prick. i just went to the page and love that you put a new beta so going to download it. April 22nd, 2013 (6:44 PM). Well actually there is still some cool things you could add like a bike and Item finder. I have been finding glitchs that I will report. And are you gonna add some new X/Y pokemon when they come out? Also when you look at the map it shows your face is blue 0.0. I can also provide sprites of trees and stuff if you like. But yes the game is good. Tho alot more can be done. April 23rd, 2013 (3:43 AM). April 23rd, 2013 (6:11 AM). You can get one in Ultramarine City, one in Chinchila City, and there' s still one not avaliable yet. Wondering when we might be able to get some screens of the Gen 6 starters implemented? Please put spaces in between your commas, it really gets on my nerves. Sorry, I typed to quick when I was working on the text, I may try to fix it later. Does Fennekin evolve and other 2 starters from (Gen 6)? I got it lvl 25 and still nothing? Sorry, they can't evolve yet since there's still no confirmed offical data about this. Please fix the grammar. It would be much more enjoyable. Sorry, I may try later. Sorry, I must wait for the offical data. Try the newest Beta2, and you can get an ITEMFINDER in Cherry Villa, it can help you to find them easier. Just curious as to what level Kadabra evolves..? If at all. Level it up with its happiness value at 220 to evolve it. Can anyone tell me how I can evolve my Eevee-S into a Sylveon? Also where may i get a water stone? Thanks! Simply use SUN STONE to evolve it, and you can buy a Water Stone in Lividity Supermarket. Thanks for reporting, I've fixed them, and I made Haxorus DRAGON/FIGHTING on purpose, if this make you feel not good, I may change it. If you mean you need to find them for the final event, then you don't really need to find them, if you mean where can battle them after the final event, then, just go to Umber Path, you will find a cave there, after battled COBALION there, the other two will be avaliable somewhere else. 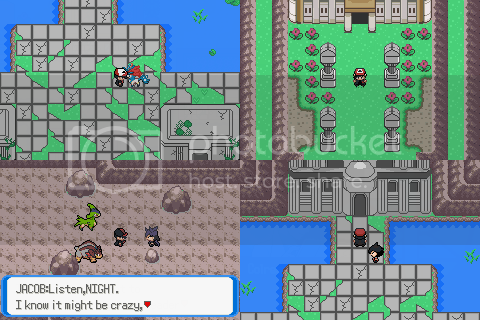 I just released the beta2 which up to the elite four event, and if possible, please update it into Beta2 since there're a few errors which may cause the game glitched. I've added Bike already, and I added ITEMFINDER in Beta2. As for the map bug, I may have a try to fix it later. The newest Beta ends after you defeated the Elite Four. If it's not good, please tell me, I may change it back. April 23rd, 2013 (10:44 AM). April 23rd, 2013 (12:20 PM). I asked this in the help thread and got conflicting answers, but how can I patch Beta 2 to the current Beta 1 I'm playing without messing up my current game progress? Would I just patch it onto my current patched game? April 23rd, 2013 (1:01 PM). April 23rd, 2013 (1:42 PM). Hey, loving the update 1158. I've come across one bug though, when walking past Samir in the Sky Castle, he talks to you, begins to fight you and then the game sort of freezes during the battle start animations. Any idea why this might be? I can provide screenshots if required. Also the grunt to the left on the first level of the Sky Castle has no trainer data, just a hiker with one of those level 0 missing pokemon. April 23rd, 2013 (3:20 PM). I just downloaded the Beta 2 UPS file. How do I replace the Beta 2 save file with the Beta 1 save file? By the way, I'm stuck on finding the four keys. I know you said you added an Item Finder to Beta 2, but I don't want to restart my game unless something bad happens. Can you at least post the locations of the four keys? April 23rd, 2013 (3:26 PM). April 23rd, 2013 (4:11 PM). I'm stuck in the game. Where am i suppose to go? There is a rock in front of the cave to the next city. I have 5 badges and the gym leader is away at Hoenn. April 23rd, 2013 (4:36 PM). I love the sprites, I think you're very good at it. Anyways, I can't wait for more updates! April 23rd, 2013 (9:59 PM). Patch the .ups file on another pure Emerld rom, and edit the name of the save file into the name of the newest patched rom, it'll work perfectly. And please use the newest Beta 2.2 patch to prevent some errors from breaking the game. Thanks so much for reporting these, I've fixed these errors in the newest beta 2.2. You don't need to restart, simply edit the name of the save file into the name of the newest patched rom. As for the four keys, you can easily find them with ITEMFINDER, you can get one in Cherry Villa. Go to Cherry Villa, finish all the events there, earn the badge, and you'll be able to countinue. Thanks to Vestra's report, I fixed the bugs in Sky Castle, and released the fixed Beta 2.2, please update into this beta to make the hack be able to countinue. April 23rd, 2013 (11:15 PM). April 24th, 2013 (4:42 AM). at what lvl does riolu evolve at ? April 24th, 2013 (7:19 AM). I need 2.2 in a gba file. April 24th, 2013 (7:24 AM). Riolu's evolution style got changed so he/she evolves at lvl50. April 24th, 2013 (9:00 AM). Does anyone know where to find a Fire Stone? April 24th, 2013 (9:23 AM). where is tm earthquake...i have a nidoking....and all it has is horn attack ..and it doesnt even learn good moves..lolz...and does magmar evolve by firestone to magmotar or lvl up? April 24th, 2013 (2:58 PM). for some strange reason I'm getting that 'Failed! Checksum invalid' thing when patching with tsukyomi, despite trying to use a clean rom and the old rom to patch. Any idea why? I know the rom is clean and reliable as its the same one I've used for other games. April 24th, 2013 (3:40 PM). April 25th, 2013 (12:40 AM). Edited April 25th, 2013 by Oddrane. Is there a HM Fly in here? if so, when do you get it? Great hack so far btw, really enjoying this one. Is it also possible to get a list of how the changes in evolutions are? April 25th, 2013 (4:51 AM). April 25th, 2013 (6:54 AM). Thats the ups file. He hasn't put beta 2.2 in a gba file. 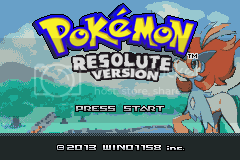 Also you would need a emulator if you don't have one.